LOS ANGELES – When choosing the right dining table and chairs, there are no rigid rules. Think about mixing and matching pieces instead of plunking down money for a perfectly matched set, experts say. 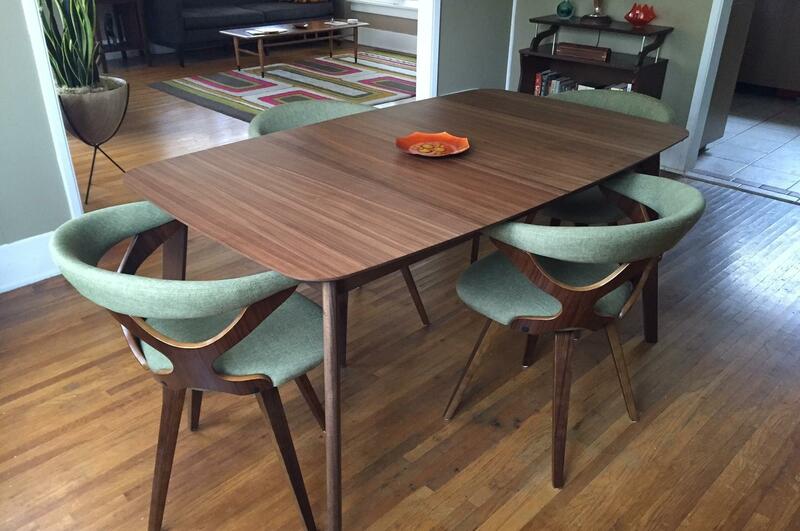 So when my husband and I recently picked out a new dining table and chairs at a local furniture shop, we went for a rectangular walnut table with a built-in leaf, and then chose 1960s-style chairs with curving wooden backs and green upholstery. We wanted the table to fit in with our vintage and midcentury modern-style furniture, and the chairs to be chic and comfy. Think about your style, budget, the size of your dining area, how you like to entertain, and how you’re going to use the table and chairs – are they just for eating, or also for homework, kids’ projects, work? Start by measuring the space, whether it’s a breakfast nook, kitchen, large dining room or small college dorm. “You have to have room to pull the chairs in and out, and be able to move around the table,” said Panos, who suggested leaving 36 to 48 inches on all sides, away from walls and other furniture. Tables and chairs can range from a $200 wooden dining table and $30 wooden chairs from IKEA, to $250 to $800 tables at chains Cost Plus World Market and Crate & Barrel. Higher-end tables can cost thousands of dollars at boutique stores, antique stores and upscale outlets such as Restoration Hardware. Shipping furniture bought online can also bump up the cost, Panos said. Ebee Martinez owns Sunbeam Vintage, a Los Angeles store that sells new, on-site handmade, imported and vintage furniture. The store specializes in midcentury modern and midcentury modern-inspired pieces, as well as ’70s-style Hollywood glam chrome, gold, copper and brass accented tables and chairs, which are making a comeback, Martinez said. Based on a late ’50s design by architect and designer Eero Saarinen, tulip tables – with a smooth central column resembling a water drop – have become popular. Sunbeam Vintage carries reproduced versions with wood, white laminate, Formica, marble, and less pricy faux-marble round, oval and rectangle tops. Upholstered dining chairs can also double as accent chairs in a living room, she said. Getting a table with a built-in leaf makes sense if you’ll be holding both cozy family dinners and Thanksgiving for 16 people, noted Panos. The built-in aspect means you don’t have to take the leaf out and store it somewhere. Of course dining tables are often used for much more than eating. Panos, who has three kids, offered some quick tips to avoid art-project messes on the dining room table: Cover the table top with a soft, fitted mattress pad, she said, and use round cork placemats. Parents of small kids should choose a dining table with friendlier rounded edges, she suggested. A veneered or laminate table is easier to clean, and cleaning products are available to help remove rings on wood, said Martinez.